It’s that time of the year. I love it when the Superbowl NFL playoffs come around each year. My daughter has recently discovered a love of all things football, so I thought it would be fun to share some of my favorite game day appetizers with her to celebrate the occasion. These Game Day cheese balls are fun, colorful, and most of all – delicious and easy appetizers! This shop has been compensated by Collective Bias, Inc. and its advertiser. All opinions are mine alone. #MakeSB50Sweeter #CollectiveBias It’s time for some Game Day Cheese balls! These game day cheese balls will tempt both sweet and sour taste buds. These cheese balls have a cheesecake like texture and are just plain amazing! And since Jess is also a huge Skittles fan (as in dive right in there and have a Skittles party kind of gal) I thought that using her favorite candy would be such fun to do as well. For this year’s party fun, I plan to make two cheese balls that use Skittles candy. One will make use of the normal Skittles candy and the other uses Skittles sour candy. These game day cheese balls have a whole sweet and sour thing going on for Game day and will satisfy both taste buds in a fun way. Which are you? A sweet or a sour Skittles party person? Both of these appetizers are fun to make. With ingredients like these, it’s also a tempting project. 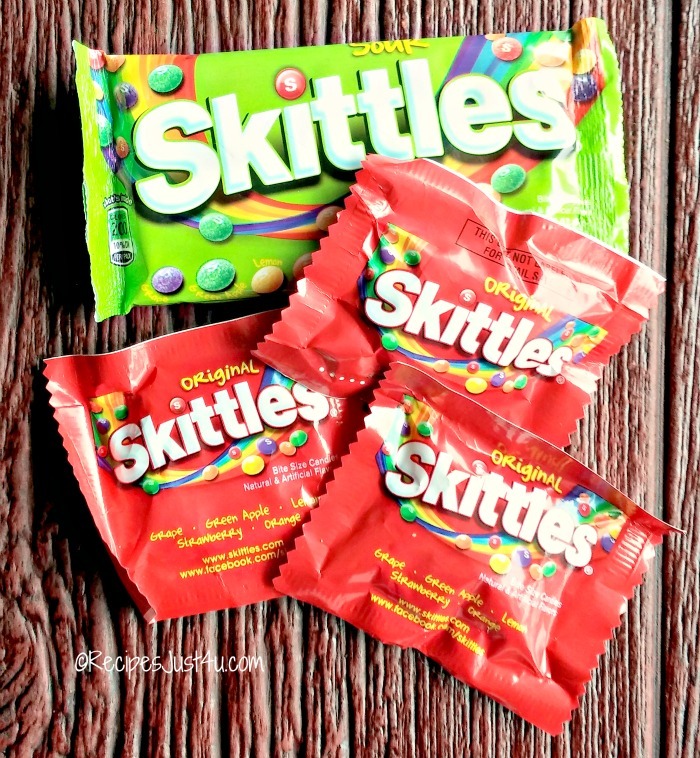 Be sure to have extra Skittles on hand for snacking, both during the Game day and during the cooking day! Basically both appetizers are some version of a candied cream cheese dip, but each has its own twist on the idea. 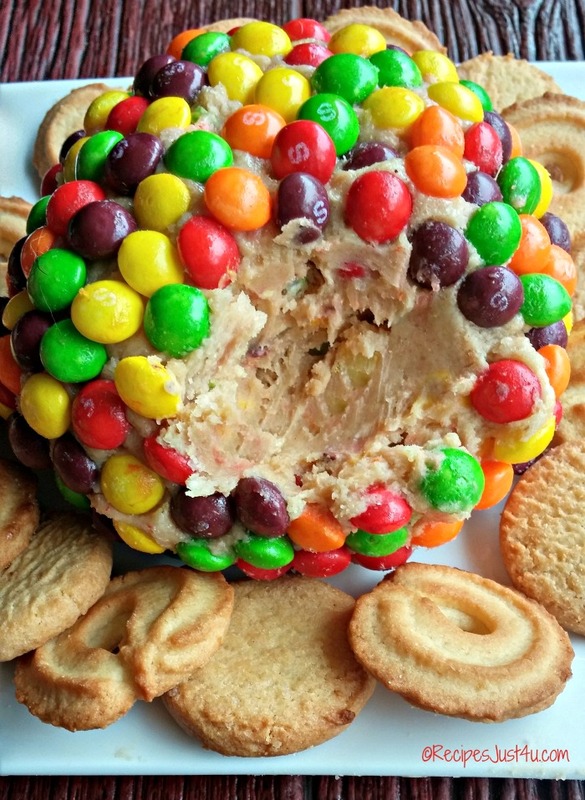 The basic Skittles candy ball combines peanut butter and brown sugar and has the Skittles candy both on the inside and decorating the outside of the ball. How fun and colorful this will be on your Game day table! I used shortbread wafers and fruit for dipping into this ball. Vanilla wafers also work well. The consistency of the sweet ball is perfect for dipping. It is not too thick and dips well on a small wafer style cookie. It is sweet and creamy and will satisfy your sweet tooth with just a few nibbles. Serve this one with a spoon for easy dipping. 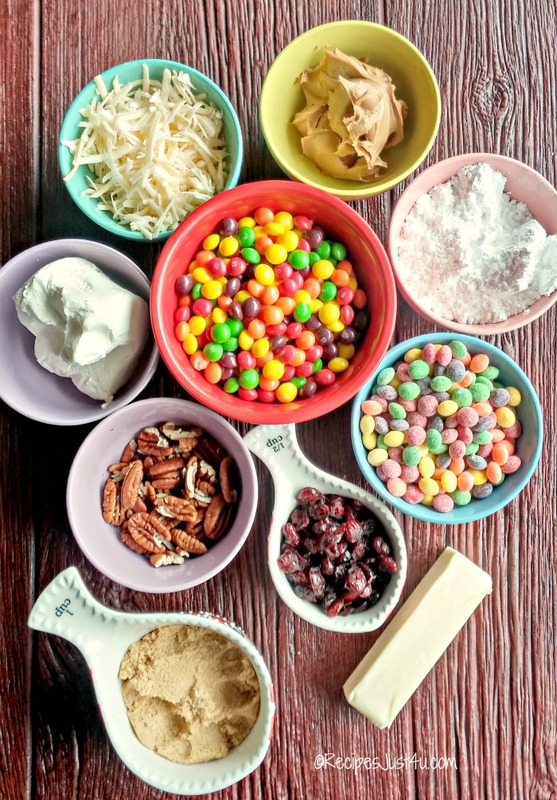 The Skittles sour ball has most of the Skittles sour candy inside the ball, along with nuts, sharp cheddar, and dried cranberries as well as the cream cheese. This slightly more savory ball with a tangy sweet surprise is coated with chopped pecans and has a few Skittles sour candies on top. I will serve this one with some sliced vegetables and round knot pretzels. The sour ball has a consistency more like a normal cheese ball. Have a knife nearby to spread on your veggies or pretzels. It is tart and tangy, with lots of crunch and just a hint of sweetness. 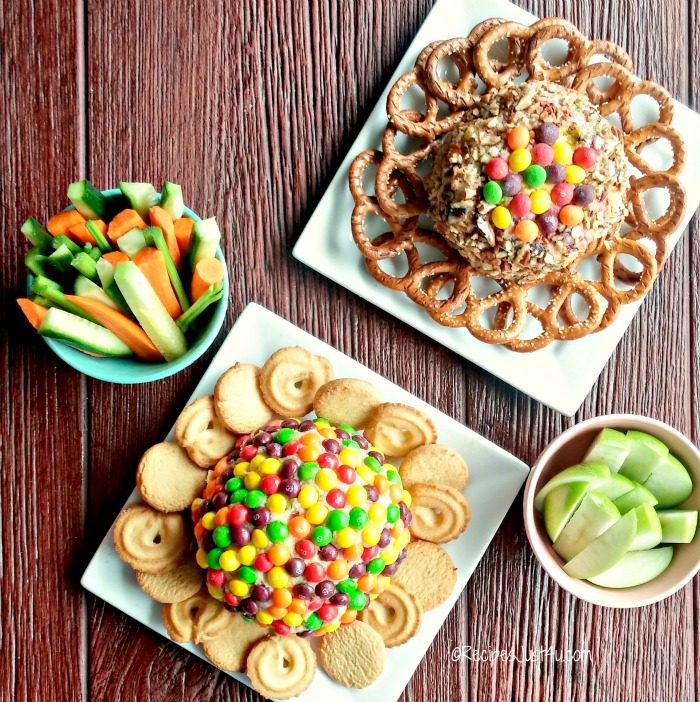 Whichever Game day cheese ball is your favorite, one thing will be sure ~ both are super delicious and a fun addition to your Superbowl celebration. Both dips are super fun and your guests will love them. They are creamy and chunky and satisfy your taste buds, whether then tend more to sweet or to sour. For best consistency, remove them from the fridge about 30 minutes or so before party time so that they can be easily dipped or spread. We all love the Superbowl ads, don’t we? Making these great recipes is a great big shout out tSkittles who are also official sponsors of the NFL/Super Bowl. These two recipes for Game day cheese balls are not only great tasting but colorful as well! They will disappear from your Game Day table before you can say Super bowl! Would you like to recreate these recipes? Skittles is here to Make Super Bowl 50 Even Sweeter. For a limited time, participating products will be on sale for up to 20% off. 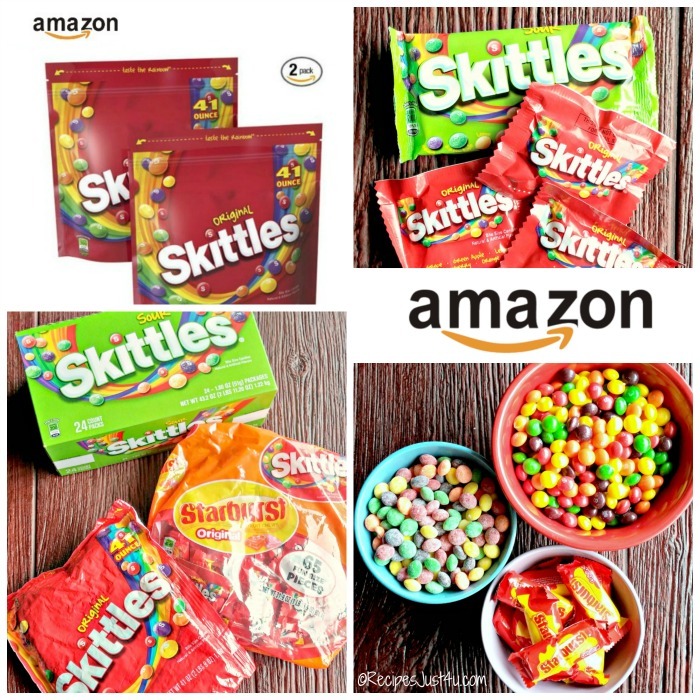 You can purchase Skittles, Starbursts and Snickers on Amazon. I shop with Amazon all the time because it makes it so quick and easy to get the products I need. What do you think of these Game Day cheese balls? Which would be your favorite? Tell us in the comments below. For more Game day appetizer ideas, be sure to visit my Pinterest board. 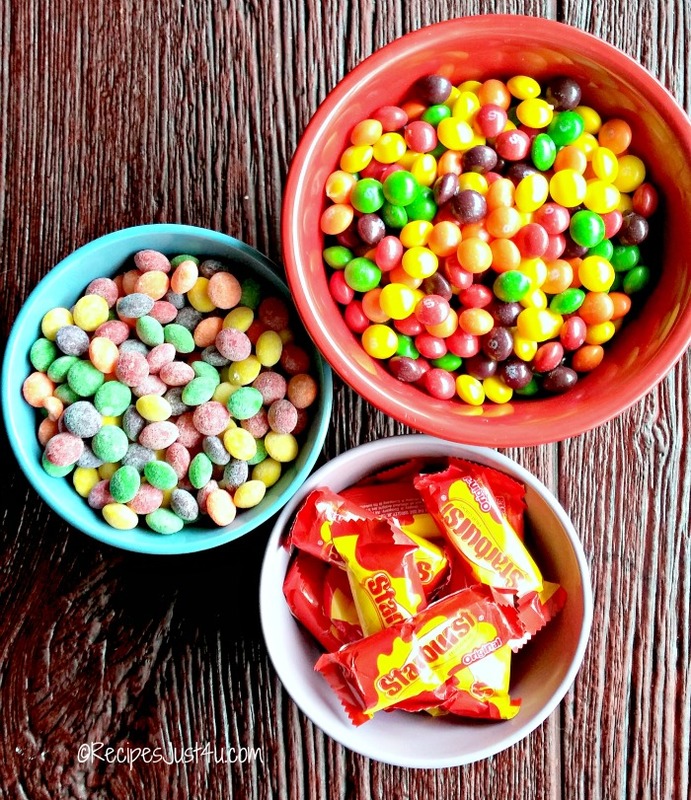 In a small shallow bowl or plate, add the remaining 1 cup of Skittles candy. 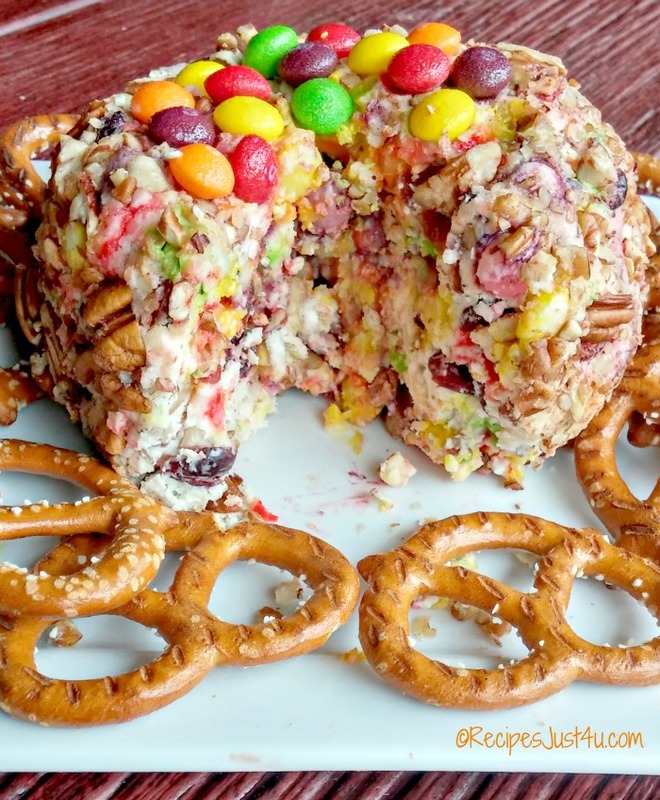 Unwrap the cheese ball and roll into the Skittles until completely covered. Refrigerate until ready to serve. For easier spreading, remove from the refrigerator 30 minutes before serving. 1 extra cup of chopped pecans for coating the ball. Place plastic wrap on a counter and place the cheese ball ingredients. Wrap and form it into a ball and place in the fridge for 1 hour until set. Place the chopped pecans on a plate and roll the cheese ball in them. 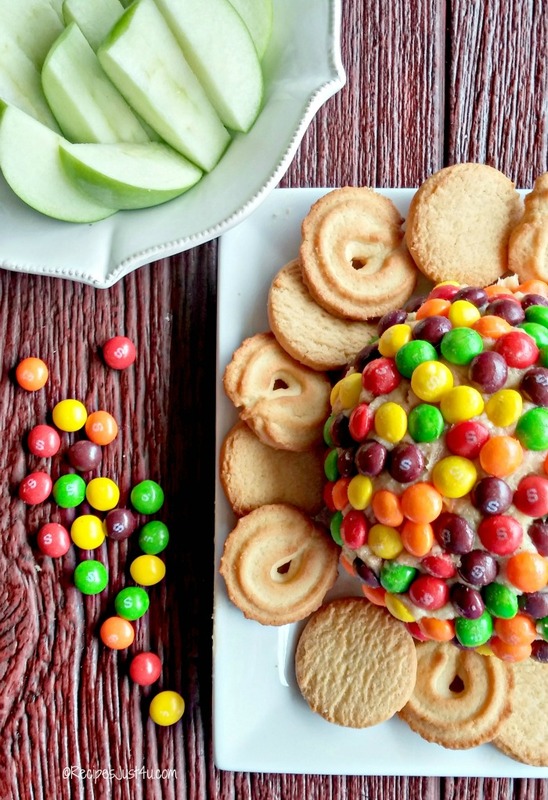 Add a few of the Skittles sour candy on the top of the ball for decoration. 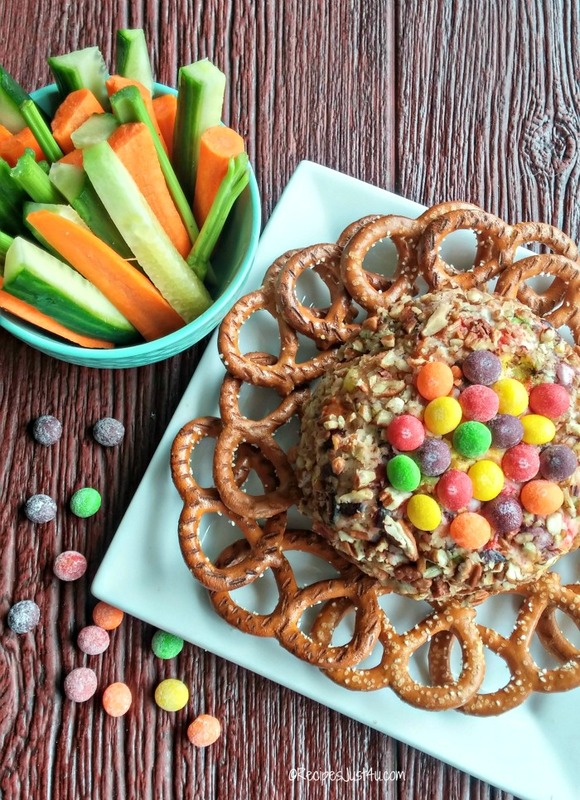 What a fun spin on the average cheese ball! This is so awesome, I need to try this!!! Thank you for sharing! It all looks so yummy and so colorful. It would be wonderful for any party I’m sure. Thanks for sharing. This is really neat. I have seen cheese with sweets before but this is something different. Such a unique way to have a cheeseball! Wow never thought to put Skittles in cheeseballs. This would make a fun snack at a party for sure! We love it. It made the cheese ball very crunchy. love the presentation! everything looks good and its definitely a unique recipe for sure! thanks for sharing this. Thanks Janna. Glad you like it! I love me some skittles, purple and red are my favorite colors! I don’t think I’ve ever had a cheeseball, neither sweet or sour but I’m all for game day snacks. The Super bowl has a tendency to fall on my birthday which gives me a bigger excuse to party! Perfect! One cheese ball for your birthday and one for super bowl! I love a good cheeseball and these look amazing!! I can’t wait to make them and try them!! I hope you enjoy them. We loved them at our house. Have fun with them Ricci. Oh my gosh this looks so delicious!! I can’t wait to buy everything this Friday to make it. Especially the cheeseball, it looks so mouhtwatering! I haven’t had cheese balls in years. This are so pretty, and look delicious. Would make a great appetizer for a party! Beautiful pictures! Thanks Linda. We really loved the taste. I LOVE Cheeseballs! My all time favorite was this delicious Snickerdoodle Cheeseball I made a few years ago. I bet this would be a huge hit at a kids birthday party too… well, by the kids, not so much the parents. That sounds amazing! I’d love to try it. how cute and yummy looking. I have marked this for something in the future. I’m a huge fan of anything cheese related, I consider it a condiment! lol I love the idea of a sour cheese ball, sour candy is another one of my favorites! The sour one was my husbands favorite. These dips look so good. My kids would love for me to make these for game day. It looks awesome! Thanks Michele. The kids would have a great time making them. We always have Skittles in my house. My daughter loves them. At first when I looked at this I thought what!?! But then I realized this could be a real game changer for multi-tasking snacking! All tastes buds are treated with them! I love this! I love that it’s sweet and not savory; I bet it’s the perfect game day snack. And I love the presentation! It’s the first time I have tried a sweet one and I loved it. I love how you could use your team colors of Skittles and make this a Super Bowl appetizer for your favorite team! Or all one color for a birthday party! So much fun! I’ll take one of each, please! What delicious additions to my game day party! Cheese Balls are one of my favorite things. Looks so yummy! Somehow I’ve never tried a cheese ball, but these sound so delicious! I love how you have a sweet and salty version. I love Skittles so this would be a hit in our house! I love cheeseballs but would never think to do one with skittles. The kids I’m sure would LOVE it but I don’t keep much candy around the house so may not be making this anytime soon. Yes…it’s a tempting cooking recipe for sure! These sound yummy and a great alternative to a traditional cheese ball. Thanks Heather. I thought so too.